6 Music celebrates Sheffield electronica with a chance to hear Heaven 17 and La Roux join forces in a session from 2010, plus tracks from The Human League and Cabaret Voltaire. 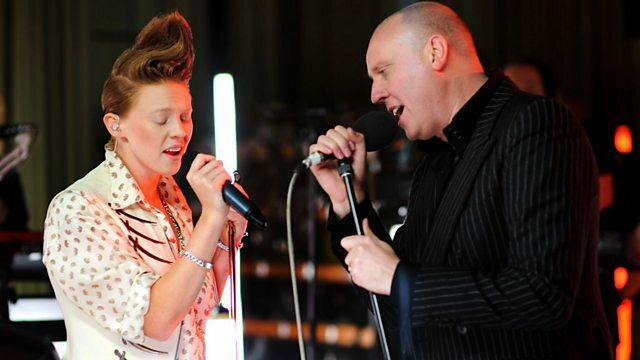 Another chance to hear Electro legends Heaven 17 and breakthrough electro artist La Roux join forces at the BBC's Maida Vale studios in a very special session from January 2010. They play some of their own songs, perform on each other's material and collaborate on a cover. Three decades ago, Heaven 17 were instrumental in the popularisation of electronic music in the UK, while La Roux have come to prominence as one of today's leading electro torchbearers. In bringing these artists together, 6 Music illustrates the lineage and influence of the genre from the 1970s through to the present day. Also celebrating Sheffield electronica with archive sessions from The Human League and Cabaret Voltaire.